When buyers come to me and ask about the top condominium buildings in Jersey City, my first answer is almost always 77 Hudson. Towering 48 stories above Hudson Street in the sought-after Paulus Hook neighborhood, 77 Hudson is as visually striking as it is conveniently located. The entire exterior is a wall of glass, so the tower practically glitters in the sunlight. Even more noteworthy, 77 Hudson was built by K. Hovnanian and is a New York City-quality construction building on the waterfront. Though there are many reasons why 77 Hudson is such a desirable place to own real estate, here are the talking points. Along with this building’s convenient location, 77 Hudson’s resort-style amenities, luxurious appointments, and spacious interiors contribute to its desirability. These condominiums are high end, generally falling between $460,000 and $2,700,000 in price. You can view available condos for sale in 77 Hudson here. If you’re curious about what these condos have recently sold for, contact me for the full 77 Hudson Building Sold Report. 77 Hudson is ideally located across from Manhattan’s financial district and mere steps from upscale restaurants and shops in Downtown Jersey City. Residents have easy access to numerous transit options, including the PATH station and NY Waterway ferry, from this building. Manhattan skyline views, floor-to-ceiling windows, and luxe features await in many of 77 Hudson’s condominiums. But the luxury lifestyle doesn’t end at your front door. For a full list of amenities, as well as current market stats and real estate listings, read our profile of 77 Hudson here. Don’t let the perfect condo pass you by. Sign up for new listings alerts for this building and be the first to know about properties that match your search criteria. 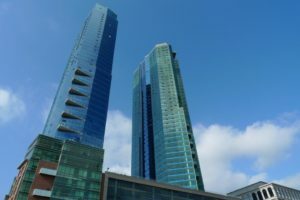 Buyers who are searching for condos with more square footage and unique floorplans tend to look to 77 Hudson. 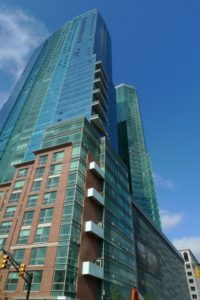 If you’re considering a luxurious condo in an excellent location, I can provide you with additional real estate resources and information about this Downtown Jersey City condo building. Contact me, Walter Burns, and let’s discuss your plans.